UyeSee G1H is one of the first Android TV boxes powered by Rockchip RK3288 quad core Cortex A17 SoC. I’ve already listed specs, and shown a few pictures of the device and the board in my “UyeSee G1H Unboxing” post, so today I’ll write a full review, checking out the user interface, testing video playback capabilities, network and storage performance, play a few games, check hardware features are working as expected, and runs some benchmarks on the platform. There’s an infrared remote control with the device. I’ve inserted a CR2032 battery, and although it works great in the user interface, it becomes useless with Android apps, so instead I’ve opted to use Mele F10 Deluxe air mouse which brings mouse and keyboard support. Before powering up the device, I’ve connected an HDMI cable, the RF dongle for Mele F10 Deluxe, a USB hard drive, and an Ethernet cable. Connecting the power supply will start the device automatically, and the boot is super fast compared to other devices I’ve tested, as it takes about 18 seconds only. 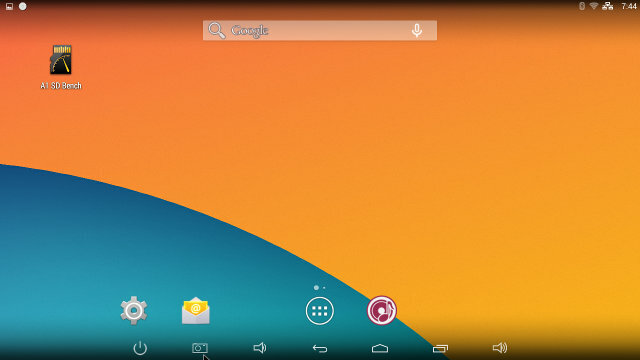 There’s a custom launcher as shown above, as well as the stock Android home screen as shown below. The status bar is disabled by default, but I’ve enabled it for easier control with the air mouse, and to take screenshots. It looks pretty, but unfortunately this must have been designed for the Chinese market, and all buttons report “App not installed”, except the Settings button which goes to the Android settings. You can use the arro keys to navigate, and if you go right, you’ll find the all the you’ve installed apps. 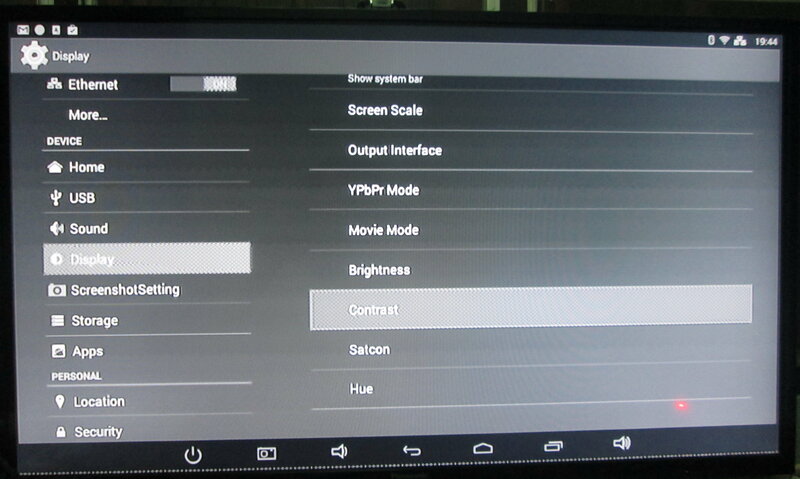 This menu has some animation that are extremely smooth, probably thanks to the Mali-T764 GPU. However, if you click on the screenshot above you’ll find out the resolution is set to 1280×720. 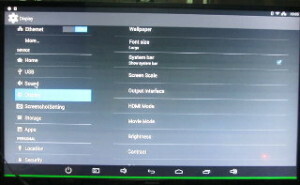 I’d assume most people don’t buy the latest Android mini PC to get a 720p machine, but you can change to 1920×1080 resolution in the settings, and the user interface will also be set to 1080p. I don’t have a 4K TV so 4K options did not show up. The launcher above won’t look very nice at 1080p, because graphics are made for 720p, and a large part of the bottom of the screen will not be used. There’s no such problem when switching to the stock Android home screen. Going to the Settings, we’ve got all usually Wireless and Networks options for Wi-Fi, Bluetooth, and Ethernet, including VPN, Portable Hotspot and so on. There’s a Home menu to select the launcher, and ScreenshotSetting menu, both of which I did not notice in most other firmware. The Sound settings like you choose between “Default Output” (PCM / Down-mixing), “Spdif Passthough”, and HDMI Bitstream (HDMI pass-through), but I don’t have an audio receiver yet, so I could not try the pass-though options. 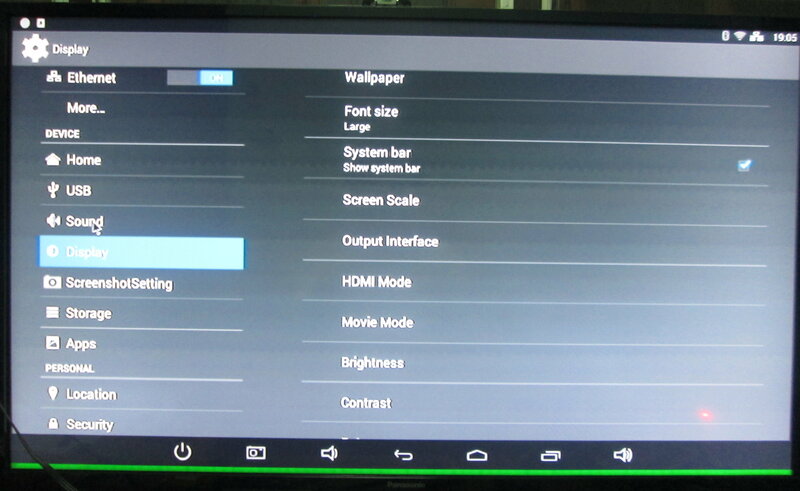 The Display settings will allow you to hide or show the status bar, adjust for overscan, select HDMI, YPbPr, and “TV” (Composite) video output, as well as the resolution: “auto”, 1080p 24/25/30/50/60Hz, 720p 50/60, 720×576 or 720×480. If you have a 4K TV, 4K options should show as well. I’ve been informed there’s currently a bug for 4K @ 60Hz, but it will be resolved in the next firmware upgrade. I’ve done most of my testing with HDMI, and I had no problem, but I also tested composite and component (YPbPr) video output. Composite looks fine, but there’s a green line on my TV that could not be removed even after using the “Screen Scale” menu. YMMV. Component output is more problematic as it is only shown in Grey (Y signal), I could not get the Chrominance signal to show which any cable combination I tried. My device comes with a 8GB NAND flash, and they’ve partitioned it with a 1.91GB “Internal Storage” partition for apps, and a 3.88 GB “NAND FLASH” partition for data. I really prefer a single partition for everything, but even after installing all apps I needed for testing I still had 1.17GB free in the “Internal Storage” partition. It may become a problem if you install many apps, especially games which can be rather large. Other settings are pretty standard, and the developer option are enabled by default. 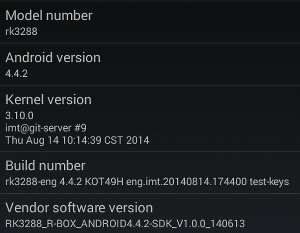 The “About device” section reports the model number as “rk3288”, Android 4.4.2 on top of Linux kernel 3.10.0. The firmware is not rooted, and I don’t have male to male USB cable, so I could not root it via the OTG port. I could install most applications I tried on Google Play Store including Root checker, Antutu, Quadrant, Beach Buggy Blitz, etc…, but a few would just report my device is not compatible such as Real Racing 3 (but many Android STB have the same issue) and Vidonn activity tracker app. I have had some 941 errors from time to time, failing to install an app, but these were possibly network error unrelated to G1H. Paid apps such as Sixaxis Controller installed properly. In order to play Riptide GP2, I also installed Amazon AppStore without issue. There’s no power button, so you can’t power off the device gracefully, only put it in standby mode with the IR remote control power button, The soft power button in the status did not work for me. Despite having only a 5V/2A power adapter, connected a USB hard drive, I did not seem to have issues with a lack of power, except possibly at the end of one Antutu test at 1080p where the screen went blank. The box can get pretty hot however. After Antutu, the max temperature on the top and bottom of the box were respectively 53 °C and 60 °C, after after playing Riptide GP2 for 30 minutes at 1080p, it went all the way up to 63 °C and 71 °C, which means the processor even gets hotter, possibly well over 80 °C, I’m not sure this can be good if this happens too often. The firmware is very smooth most of the time, except when it’s writing to the flash, while installing an app for example, where the mouse pointer may not react for short periods of time. Stability is OK, but I had the screen turn off at the end of Antutu benchmark once, requiring a power cycle, and another time the box rebooted itself, while browsing files in ES File Explorer. I like the fact that you can switch between 720p and 1080p user interface, as you want prefer the former for smoother games, and the former for video playback for example. You can watch the video below to see what the UI looks like at 1280×720 and 1920×1080 resolution, as well as the difference settings options available. I normally play videos from a SAMBA share over Ethernet using XBMC. However, the box does not come with XBMC, and currently XBMC does not support hardware decoding for HEVC, so instead I’ve chosen to test videos with MXPlayer. 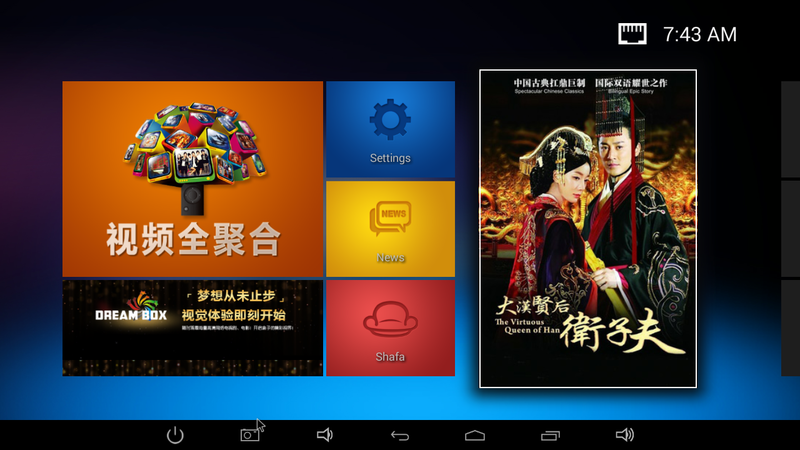 I did try to install XBMC using XBMC Updater, and downloaded both stable and nightly apk, but the system reported the apk were not recognized. So I tried to install SPMC via Google Play instead, but atfirst I got a 941 error, and I could only manage install it after most testing was complete at a later stage. Using Es File Explorer, I connected to my SAMBA share, and unfortunately even 480p video were buffering like crazy, so I ended up using a USB hard drive. The Ethernet issue may not be due to G1H, but my Gigabit switch, as I’ll explain in the networking section. Nevertheless, the takeaway is that videos were played from USB hard drive with MXPlayer, unless otherwise stated. Real Media (RMVB) – RV8, RV9, and RV10 – OK, much smoother than any other device I’ve tried, and according to MXPlayer using HW decode. H.265 codec / MPEG TS container – No video, audio only. Sintel-Bluray.iso Blu-ray ISO file could play in MX Player but with video only, I could not get audio to work, even switching to software decode. sintel-2010-4k.mkv – Can play but with some slow downs from time to time. I can get audio by switching to audio S/W decoding. Several AVI, MKV, FLV and MP4 videos in my library could play fine with SPMC. I also played a complete 1080p video (1h50) in the box, and I had no issues either. At first, I was not too happy with video playback using MX Player only, but when you put SPMC (XBMC) into the mix, it looks much better. The main thing you lose (confirmed) with XBMC is H.265 / HEVC hardware video decoding. The network test consists in transferring a 278 MB file between a SAMBA share and the internal flash using, and vice versa, repeating the test three times using ES File Explorer. Wi-Fi performance appears to be inconsistent, as I had three much different transfer times: 3m20s, 2m43s, and 4m31s, averaging a rather disappointing 1.31 MB/s. I also tested Miracast via Rockchip’s “Wi-Fi display” app included with the firmware, and after a few tries I managed to mirror my Android phone display. Now.. Ethernet.. This gets interesting. At first, when I used the device connected to Ethernet, it felt sluggish in the Play Store, and soon found some serious issues while transferring a file from a SAMBA share using ES File Explorer, as throughput was around 300 to 500 KB/s most of the time, and sometimes it would even stall. This looks very similar to the issue I had to Wetek Play. I’ve recently purchased a D-Link DGS-1005A 5-port Gigabit switch for test, and used it in my last five reviews. That means three products had no problem with the switch, and two had issues. Which item is guilty is difficult to prove. So I decided to insert my older (D-Link) 10/100M hub, between the device and the Gigabit switch and it worked. I tried to connect the device to my Gigabit switch with a different cable, and it also worked, but the connection is only 100M. If I used the original cable (the same I used for all other reviews), it will detect a Gigabit connection, but the Ethernet LEDs will “funnily” blink on the device, and the Link LED will turn on and off. So at the end of the day, I did not manage to get a proper Gigabit connection, so I tested Fast Ethernet, and the result is OK.
Like with Probox2 EX, this test used the ES File Explorer version with improved SAMBA performance, which may have helped a bit for Ethernet, but did nothing for Wi-Fi. Transferring a picture via Bluetooth worked just fine, after pairing G1H with my Android smartphone (ThL W200). I skipped Sixaxis test for PS3 Bluetooth Gamepad support, as it required root. After installing Vidonn app for Vidonn X5 activity tracker, it could connected via Bluetooth 4.0 LE to retrieve the data. Both a micro SD card and a USB flash drive formatted to FAT32 could be mounted and accessed successfully. I’ve also connected my USB 3.0 hard drive with NTFS, EXT-4, FAT32, and BTRFS partitions. and as usual the Linux file systems are not supported, at least not by default. After setting the custom locations set to /mnt/usb_storage/USB_DISK2/USB3_NTFS in A1 SD Bench to benchmark the NTFS partition, I got a read speed of 27.5MB/s and a write speed of 25.98MB/s. There’s not that much differences between difference platforms at USB 2.0 speeds. Last time, the eMMC flash in Probox2 EX could be read at 27.57MB/s, and written at 15.11 MB/s, and the eMMC used in G1H as better read speed at 44.50 MB/s, but much slower write speed at 7.3 MB/s, which may explain some the rare slowdowns I experienced while playing with this mini PC. Skype sort of worked with my UVC USB webcam. I tested audio successfully with the Echo service, and I could see the video, but as I tried to leave a video message the app crashed. Google Hangouts could detect the webcam, but when I did a video call the camera image did not show up. With Mali-T764 GPU, Rockchip RK3288 should be a star when it comes to video games. I’ve tested the three games: Candy Crush Saga, Beach Buggy Blitz, and Riptide GP2. Candy Crush Saga unsurprisingly worked fine as with any device. Beach Buggy Blitz is a little more challenging, and based on my experience Riptide GP2 is even more demanding. Testing games was actually the first thing I did, at first the resolution was set to 720p. I used Tronsmart Mars G01 wireless gamepad to control both games. I went to Beach Buggy Blitz settings, and maxed out the graphics settings which normally make devices based on Amlogic S802 struggle to have a decent framerate. But with UyeSee G1H, the game was just extra smooth. I did the same with Riptide GP2, and yet again very smooth most of the time. I could even win races, or battle with the lead driver at all games. That’s not usual at all, as normally I’m always fighting for third place in other Android TV boxes :). Beside the high framerate, one of the reasons gameplay is better is that I don’t have lag with Tronsmart Gamepad in this device. Switching to 1080p, Beach Buggy Blitz is still super smooth, except sometimes during the first one of two seconds of the game. Riptide GP2 is still very playable, and I’m still fighting for victory!, but it feels like the framerate may drop in the low 20, or even 15 at times. I’ve played Riptide GP2 for 30 consecutive minutes, and albeit the box gets very hot (70 C), everything is stable and smooth. Since it’s my first Rockchip RK3288 device, I’ve run a few more benchmarks than usual, and also checked the CPU details with CPU-Z app. CPU-Z has apparently not yet heard about Rockchip RK3288, as it reports a Rockchip RK3066 processor. The CPU architecture is 0xc0d, which stands for ARM Cortex A12, whereas Cortex A17 should be 0xc0e, according to this. So finally Rockchip RK3288 might be a Cortex A12, at least for the first versions. If there are other ways to check let me know. The CPU clock can scale between 126MHz and 1.8 GHz, the GPU is correctly detected as Mali-T764, and there’s indeed 2GB RAM in my device, but CPU-Z only takes the “internal flash” partition reporting 1.91 GB storage for the 8 GB flash. Results are quite surprising. According to Antutu 4.x scores, RK3288 shines in multitask, runtime, and CPU floating point testes, but graphics are about equivalent to S802 (at slightly different resolutions), and CPU integer is faster in the S802 @ 2.0 Ghz compared to RK3288 @ 1.8 Ghz. Probox2 EX has slightly better storage performance compared to UyeSee G1H but this part is mostly independent from the processor. I also tried to run Quadrant, but all I got was a grey screen as I ran the test. Vellamo benchmark is now at version 3.0, so I can’t really compared it to earlier tests I did, but UyeSee G1H performance is also pretty good here. 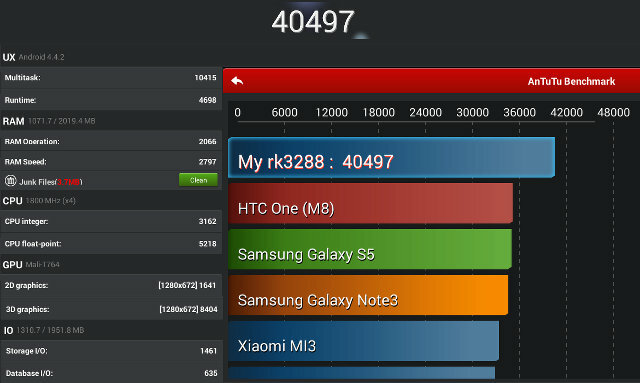 In the new Multicore (beta) benchmark, this Rockchip RK3288 solution even beats all other players. 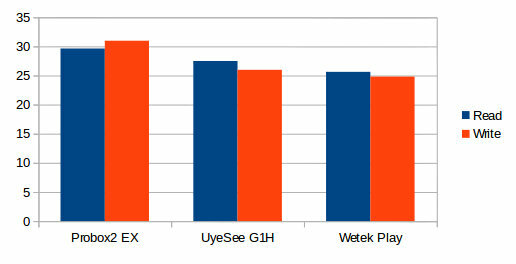 In the browser score, UyeSee G1H is only outperformed by LG G3 smartphone (Qualcomm Snapdragon 801), and in the metal score, its performance is about equivalent to LG Nexus 5 (Qualcomm Snapdragon 801). Despite the clear superior performance in games, the graphics benchmarks in Antutu were somewhat disappointing, so I’ve run Ice Storm Extreme test in 3DMark. A score of 7278 points is about equivalent to a phone based on Snapdragon 600 with Adreno 320 GPU. Many recent devices based on Qualcomm 800 and greater get score above 10,000 or simply maxes out the test, so again I was expecting the GPU to perform better in benchmarks. Excellent 3D graphics performance for games, which for some reasons does not really show in benchmarks. Video Output – 1080p support 24, 25 ,30 , 50 and 60 Hz output which may be important for some videos. 4K will eventually support 60Hz thanks to HDMI 2.0. OTA firmware updates appear to be supported (but I cannot confirm). I had quite a few problem with networking with this hardware. First Wi-Fi is stable, but relatively slow, and then the box did not want to play nice with my Gigabit Ethernet switch, but connection and performance were fine with a Fast Ethernet hub. Video playback is decent, but may still need more work, a version of XBMC with support for H.265 would be nice, but I’d assume at first all Rockchip RK3288 TV boxes will suffer from the same flaw, at least initially. If you’d like to play some 3D games this TV box will give you a much better experience than what you can achieve with the fastest Cortex A9 solution (Rockchip RK3188, Amlogic S802), and after testing the box, this is currently the main selling point of this media player. You may find more information and/or contact the company via G1H product page. UyeSee G1H is not yet listed on their Aliexpress Store, but some hardware with similar specs, but different enclosure, can be bought for $90 including shipping on Aliexpress, so we might expect a similar price for G1H. it is support of video play (include of RK3288 basic video player) of 4K HEVC decoder. But it is not support of 10bit video play. Can’t wait for XBMC to support HEVC / H.265 hardware decoding on RK3288! Any news from XBMC.org / XBMC Foundation devs about HEVC / H.265 hardware decoding? Not even sure if Android’s MediaCodec API supports HEVC / H.265 yet? or if Rockchip exposed a HEVC / H.265 hardware codec for OpenMAX IL API? “your sample has very old firmware, the ethernet has problem in your software, you should ask that factory to offer you the newest stock firmware. and after you update to new firmware, it still don’t work? then those factory ethernet has problem. Can you try OTA firmware updates? I’ll ask them. Maybe the firmware does not support AC3 decoding. I’ve seen Antutu Video Tester only fails for DTS and AC3 on devices. 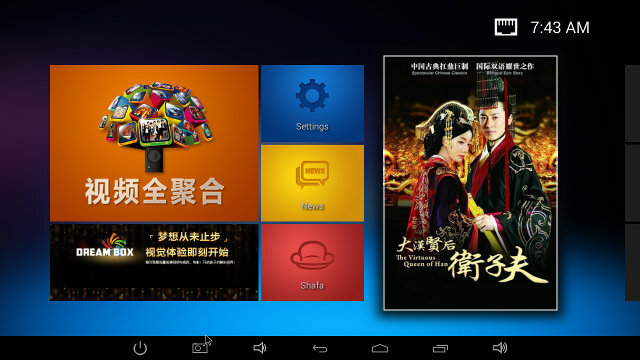 XBMC can handle it because they decode by software. I love reading your reviews, I think if you can get a better Gigabit switch or cable (?) to solve the speed issue and a 4k TV (with HDMI 2.0 and 60 fps capability) you can really test these Android boxes to the limit. My feeling is that Gopro will come out with a [email protected] camera soon which will make these HDMI 2.0 boxes all the more useful. You can try using MXPlayer but you have to rollback the codec that MX Player uses to an earlier version, since the latest versions don’t support AC3 anymore. If you Google a bit you can find out how to do this.